Though we know much more than ever about what makes up the heavens, the black space between the stars still holds many mysteries — and string theory is at the heart of the search for the answers to many of these mysteries. In opposition to the big bang theory, Fred Hoyle proposed an alternative theory, called the steady state theory. In this theory, new particles were continually being created. As space expanded, these new particles were created fast enough that the overall mass density of the universe remained constant. To understand the reason for such a theory, you have to realize that few physicists thought it likely that a dense ball of matter could spring into existence out of nowhere, violating the law of conservation of mass (or conservation of mass-energy). That matter had to come from somewhere. In Hoyle’s view, if matter could be created out of nothing one time, then why not have it happen all the time? Though Hoyle’s steady state theory would ultimately fail, in trying to prove it Hoyle would prove himself worthy in the eyes of history by developing a theory about where the dense atoms of our universe come from. 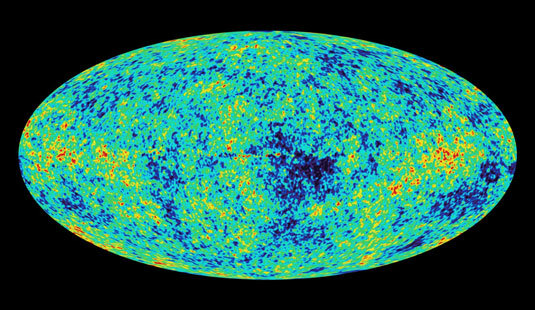 One of the major converts to the big bang theory was physicist George Gamow, who realized that if the theory were true, a residual trace of cosmic microwave background radiation (CMBR) would be spread throughout the universe. Attempts to find this radiation failed for many years, until an unexpected problem in 1965 accidentally detected it. Gamow is known to many as the author of a number of popular books on science, but he was also a theoretician and experimentalist who liked to throw out ideas right and left, seemingly not caring whether they bore fruit. Turning his attention to cosmology and the big bang, Gamow noted in 1948 that this dense ball of matter (probably neutrons, he hypothesized) would emit black body radiation, which had been worked out in 1900 by Max Planck. A black body emits radiation at a definable wavelength based on the temperature. Gamow’s two students, Ralph Alpher and Robert Herman, published a paper in 1948 with the calculation for the temperature, and therefore the radiation, of this original ball of matter. The men calculated the temperature to be about 5 degrees above absolute zero. This radiation is in the microwave range of the electromagnetic spectrum, so it’s called the cosmic microwave background radiation (CMBR). In 1965, a Princeton University team led by Robert Dicke had independently developed the theory and was attempting to test it. Dicke’s team failed to discover the CMBR, however, because while they were putting the finishing touches on their equipment, someone else beat them to it. A few miles away, at New Jersey’s Bell Laboratory Holmdell Horn Radio Telescope, Arno Penzias and Robert Wilson were having trouble of their own. Their telescope — which was more sophisticated than Princeton University’s — was picking up this horrible static when they attempted to detect radio signals in space. Fortunately, Penzias and Dicke had a mutual friend in astronomer Bernard Burke, and upon discovering the problems the two men had, he introduced them. Penzias and Wilson earned the 1978 Nobel Prize in Physics for accidentally discovering the CMBR (at a temperature of 2.7 degrees above absolute zero — Gamow’s calculations had been slightly high). Forty more years of research has only confirmed the big bang theory, most recently in the picture of the CMBR obtained by the Wilkinson Microwave Anisotropy Probe (WMAP) satellite. The picture obtained by this satellite, shown here, is like a baby picture of the universe when it was just 380,000 years old (13.7 billion years ago). Before this, the universe was dense enough to be opaque, so no light can be used to look further back than that. For more information on the WMAP satellite, check out the official WMAP website at NASA’s Goddard Space Flight Center.